I don’t play as many video games these days as when I was younger. I tend to play the ones I love to death. For example, I only have the three “Science” achievements left in the first Portal to achieve and l couldn’t rest until I’d found all the secrets in the Tomb Raider games. One of my addictions over the past year has been Bioshock 1 & 2. Set in a world that’s a combination of steampunk, art deco, and mid twentieth century style, it’s really captured my imagination. 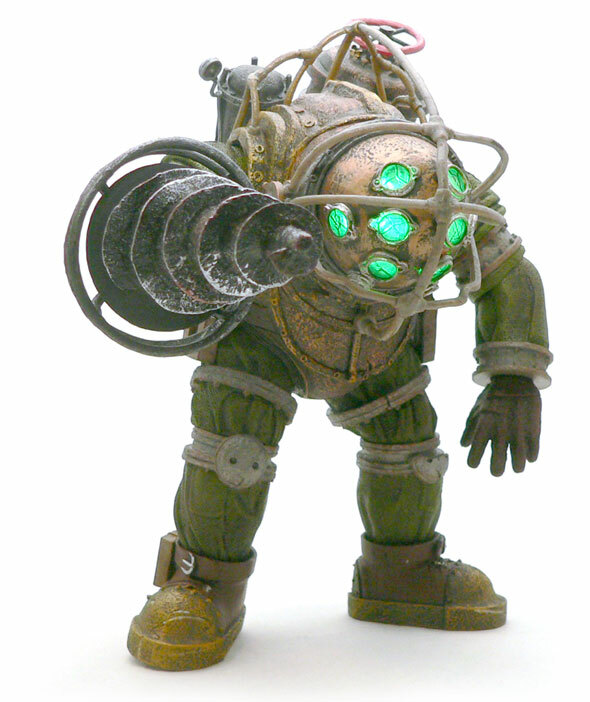 One of the major foes in the games are “Big Daddies.” Large diving suit equipped protectors of the Little Sisters. They will ignore you until provoked or you come to close to his Sister. This is the Deluxe NECA version of him. From the in game experience, I don’t have a perfect memory of what a Big Daddy looks like. Normally, I was either running, firing weapons, or just trying to stay alive. From what I can recall, this is a pretty good representation of this version. Even if it’s not perfect, I’m willing to give a little here and there, since I figured they were all slightly different from one another. One thing that absolutely blows me away on this guy is the textures. Most of his “metal” parts have that old fashioned pebbly cast look to them. The suit also has texture to it. Which if you’ve ever seen an antique diving suit up close, you know is accurate of the thick, tough material they are constructed of. The textures may be slightly out of scale, but really they give the piece a real depth and realistic look. On top of that, there some really well done paint washes here. Used in conjunction with the textures, the washes only sever to add to the depth of the detail. They also add a great patina to the look of the figure. 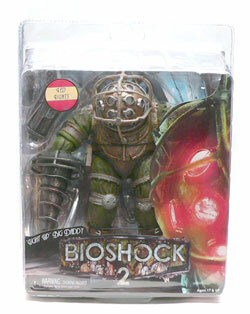 This figure has the look of a utilitarian diving suit maintained for survival and not looks. There actually is some “damage” detail to some of the parts. 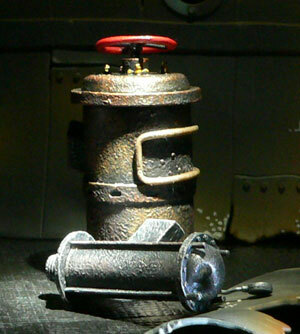 The large red wheel on the top of the larger removable tank is at a bit of an angle. The small tank has a dent in the top of it. I would imagine it would be easy to bang those things getting in and out of hatches. Even his left knee pad/weight is snapped unevenly in half. The face shows damage as most of the lens show some form of cracking. It also has the great color of your Grandma’s old copper bowls. Make no doubt about it, this is a massive figure. As such, the articulation probably suffers a tad bit. The weight of this guy would probably buckle knee joints and fancy hips. To me it’s not a huge deal here. Big Daddies aren’t know for moving around like Spiderman. Also, I’m guessing that suit is pretty restrictive. The one joint I wish they had included is a waist. It be nice to be able to get him into some swinging type poses. The shoulders do have ball joints. They are a bit limited by his design, but no horribly so. While the tanks are removable I don’t really consider them accessories. His non-removable weapon is an iconic Bioshock sight. The drill. I love the fact that it is beat up. I’ve worked in manufacturing plants most of my career. Stuff gets beat up. It’s very real world. The cage on the back side of the drill, I believe, is an upgrade you can earn in the second game. (In Bioshock 2, you are different class of Big Daddy.) Oh, and is that a little blood I see on there? The main thing that makes this version cool is the light up feature. 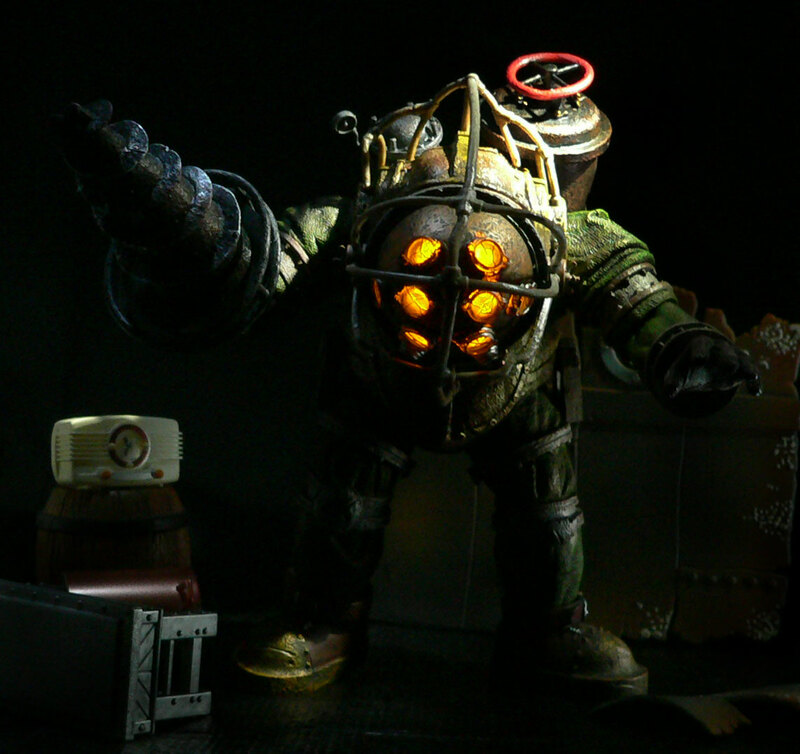 In game, the color of the Big Daddy’s lenses change based on his demeanor. Green for no threat, yellow when he senses a threat, and red when he is in combat mode. 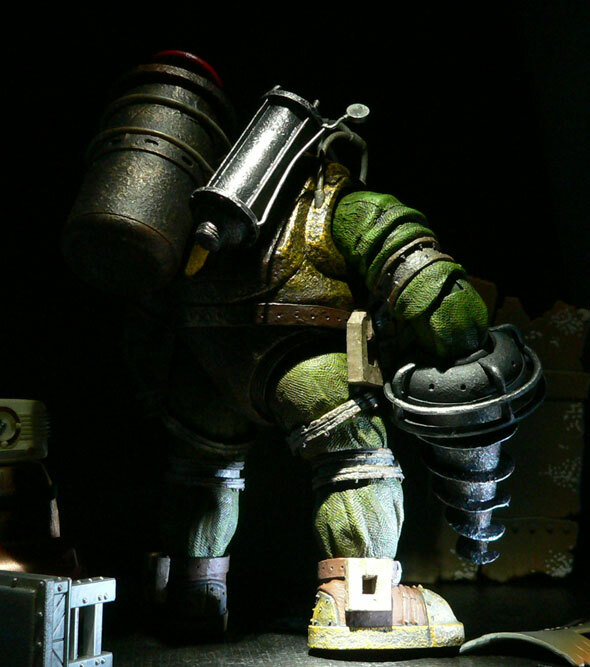 A three position switch hidden between the tanks on his back gives you the ability to light this figure up that way. For the most part, the effect works pretty well. However, if you look closely, the paint isn’t perfect around the lenses and there are spots where light leaks through. I’ll probably touch mine up with a Sharpie in couple of those places. The lights are bright and really bring the character to life. Honestly, I wish they had made him so you could plug him into an external power supply. He’d be on my desk lit up all the time. The red and green are okay, but the amber really gives the look that reminds me of the game. Kids toy? No. Neat adult collectible? Most definitely. I would imagine this guy will be on a number of desks of fans of the game. In the package, I was a bit uncertain about the light up feature. Once I tried it, I was sold on it. The one thing I would have like to have seen would been some sort of alternate weapon. Either a Plasmid for the left hand or an alternate right arm weapon. Most impressive piece. Love the pictures you took of it. 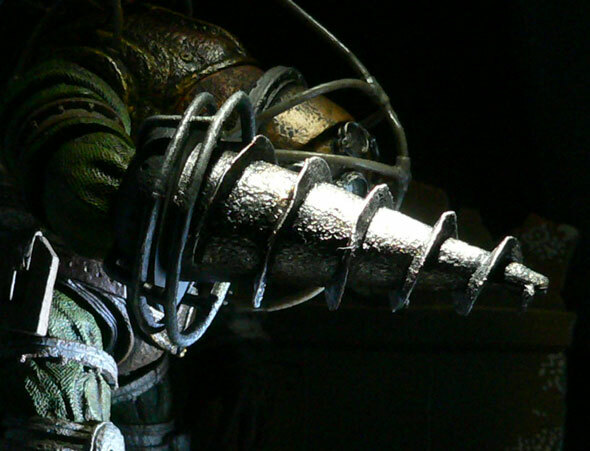 NECA may not have the market when it comes to articulation, but they sure nail everything else. What a beauty! Nice one Eng. What a beast! I’ll have to ask Mike @ Intergalactic if he has anymore in stock, your review and pics might have pushed me over the edge! I need to go see if they have any of the Little Sisters to go with him. I’d managed to avoid that line cause I knew it would be a slippery slope.